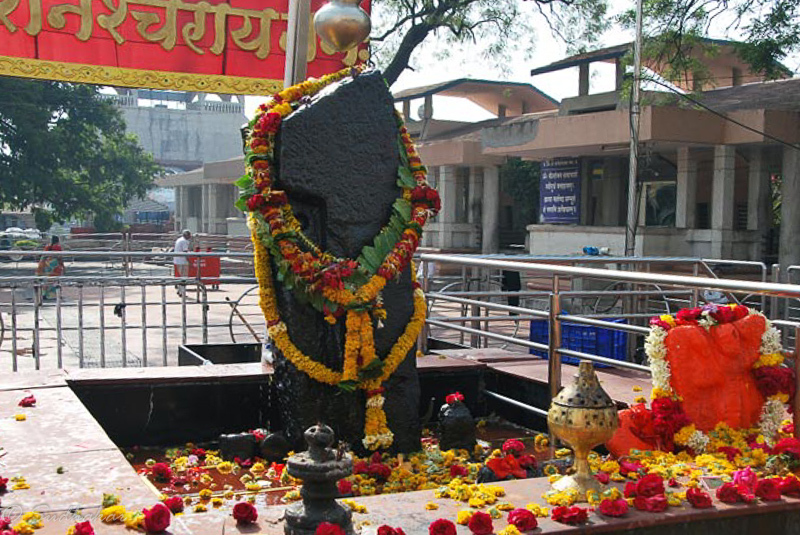 Shani Shinganpur or Shani Shingnapur is 35 kms from Ahmednagar city and 73 kms from Shirdi, is the place where Lord Shani in the form of swayambu (self manifestated) is located. Shinganpur village is the only place in the world where the homes and shops do not have doors or locks. Villagers are so afraid of Lord Shani here and believe that Lord Shani punishes the theives. As per one legend, around 300 years ago, a sheperd poked a big block of granite with a rod, and it startred bleeding. The villagers gathered around to notice the miracle. That night, Lord Shani appeared in the dream of a shepherd and said that he, Lord Shani as Swayambu form is in that stone. The thrilled shepherd wanted to build a temple ,for which Lord Shani declined and preferred to be under the open sky so he will be able to oversee the village without hindrance.He asked the shephered to do daily pooja and abhisheka every Saturday with sesame oil. He also promised to protect the whole village from burglars or thieves. The garba graha (sanctum) is in a large courtyard and the deity is in an open space with no roof. The sannidhi for Shani is on an open-air platform, five and a half feet high black rock which is beleived to be the swayambu of Lord Shani. There are small idols of Shiva and Hanuman. The devotees who visit here offer sesame oil. The oil is poured in a small vessel above the deity and the oil drips in drops anoinating the idol. The collected oil is pumped and made to circulate again to the vessel as a continuous process. In spite of so many litres of oil, the premises are very clean and dry ,well maintained by the temple staff. It is strongly beleived that with Lord Shani watching over the village,there has been no need for doors and locks for the homes and even shops.This tradition is being maintained even today. Even the local nationalised bank has no big shutters other than glass doors to facilitate air conditioning. (This came under lot of crticism fro security point of view). If the new moon (Amavasay) falls on a Saturday,it is known as 'Shaneshchari Amavasya'. Normally, in a year, there will be two or three Shaneshchari Amavasya. The Shaneshchari Amavasya in Shingnapur is observed from the mid-night of the Friday till the mid-night of the Saturday.Prayers, 'abhishek' are held. It is estimated that around 10 lakh people come within 24 hours. Temple location It is located 70 km from Shirdi and 40 km from Ahmed Nagar. 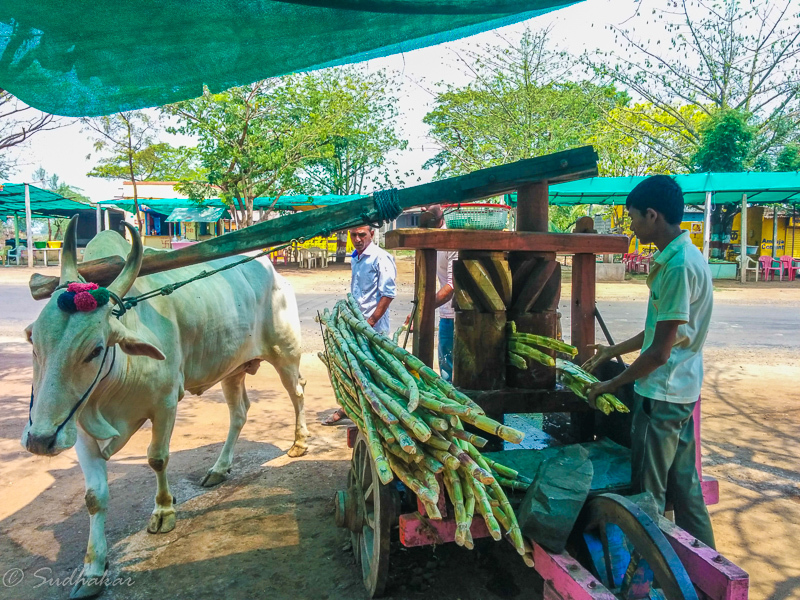 The way to Shingnapur village is dotted with many sugarcane fields and local people use bulls to extract juice from the sugarcane, instead of power operated machines. Though you can say that the juice is refreshing and very delicious, the flies that throng over the sugarcanes,vessels,and the machinery will make one hesitate, for hygienic reasons. If you can brave that be sure to demand for a disposable cup. There are many buses from Shirdi,Ahmednagar,Pune and other major towns. 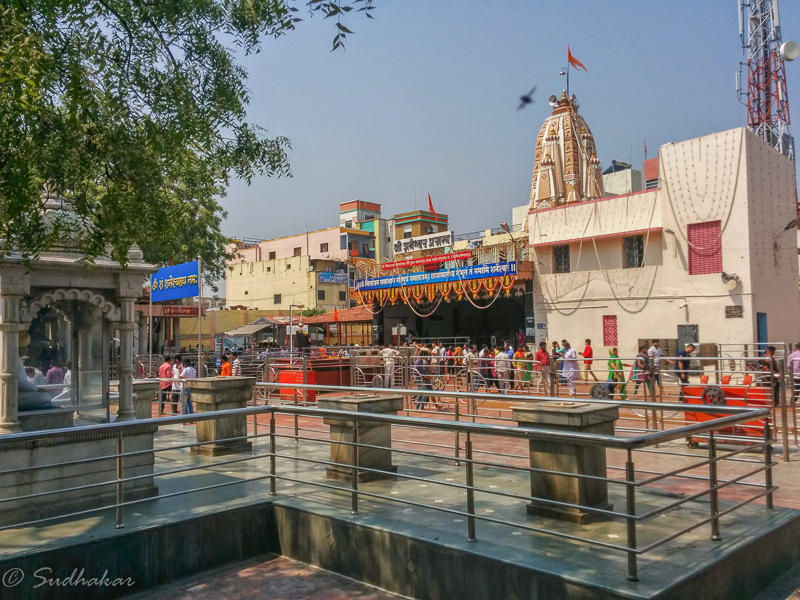 If you like a good road trip by car, I suggest that you drive a car from Mumbai covering important religious places like Trimbakeswar,Panchavadi,Shirdi and Shani Shinganpur in two days and a night. Where to Stay?There is a lodge run by the temple devasthanam. During festival days the place is very crowded and accomodation might be difficult. The better place is to stay at Ahmednagar where you have better choice. Staying overnight at Shirdi and after Sai darshan, you can visit here too.